Judy Foreman talks about America’s biggest health problem — chronic pain. Her book, A NATION IN PAIN, is a comprehensive and fascinating exploration of what chronic pain is, what’s wrong with how our nation treats it and better ways to treat it, including a saner approach to pain medication and non-drug treatments like massage, acupuncture, exercise and meditation. The book’s central thesis is that chronic pain is a disease in its own right — and deserves to be treated as the serious health problem it is. One hundred million Americans suffer from chronic pain. For 10 – 30% of them, the pain is severe. Yet our medical system is failing to deal adequately with the problem. Doctors get shockingly little education for pain management and attitudes toward pain medication often falls more heavily on fears of giving patients too much instead of enough. Many patients find that doctors throw up their hands in the face of chronic pain, often putting the cause down as psychological in origin. But they have it the wrong way round. Scientists are finding that chronic pain actually changes the brain and can result in the loss of gray matter equal to 20 years of aging. It can cause depression and affect thinking, so, while it’s not all in your head, it does affect it. Journalist Judy Foreman was one of those chronic pain sufferers. As she struggled to find treatments that would provide relief, her journalistic instincts drove her to find out what chronic pain is, why our society seems unable to confront it and what we should be doing better. 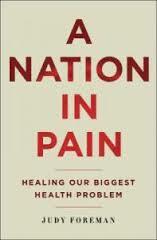 The result is her fascinating book, A Nation in Pain: Healing our Biggest Health Problem. 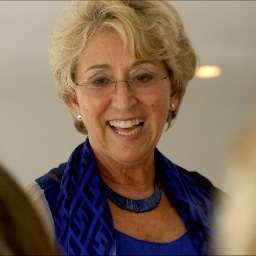 Judy Foreman is an award-winning medical journalist. She was a staff writer at The Boston Globe for 23 years, where she wrote the weekly Health Sense column, and has been a medical specialist and science writer since 1985. She was the host of a weekly, call-in webcast on health issues for Healthtalk.com. A Nation In Pain is her first book.